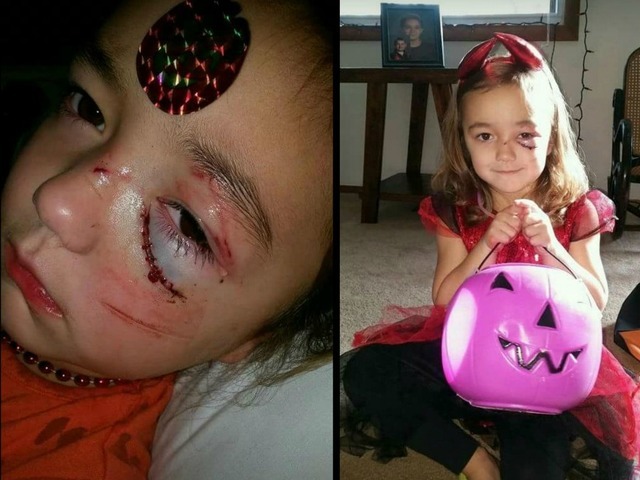 A 5-year-old New Castle girl who was attacked by A DOG before trick-or-treating on Monday will still get to enjoy the holiday she missed, because a group of volunteers is coming together to re-create Halloween for her. Caitlynn Richards was playing outside her home on Monday afternoon when her mother said she was bit by the dog. She was taken by ambulance to Saint Vincent Hospital in Indianapolis where she was treated for the bite marks on her face. Caitlynn's mother said the little girl was looking forward to Halloween and seeing all of the other children in their costumes. A group of volunteers will gather on Church Street in front of the Henry Township Trustee's Office at 6 p.m. Tuesday to pass out candy and re-create the spirit of the holiday for Caitlyn. Parents are encouraged to bring their children in costume as well. Caitlynn's mother said they will be returning to St. Vincent on Monday to see if there is anymore work that will need to be done to the little girl's face. Caitlynn turns six on Wednesday.